BudFlounders is a Legacy Library. Legacy libraries are the personal libraries of famous readers, entered by LibraryThing members from the Legacy Libraries group. » Newton 'Bud' Flounders's catalog. » Newton 'Bud' Flounders's legacy profile. BudFlounders is also an author. About meNewton "Bud" Flounders (1922-2005), a Peninsula architect and a life-long collector of gay novels, was a long-time resident of the San Francisco Bay Area and a co-owner of the Walt Whitman Bookshop, one of the first gay and lesbian bookstore in San Francisco which played an early role in creating opportunities for gay men and women in the San Francisco Bay Area to find and get access to literature for and about the LGBT community. Mr. Flounders was born and grew up in Media, Pa., a suburb of Philadelphia. 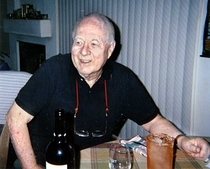 He served in the Army's supply division in North Africa and Italy during World War II and graduated in 1952 from the University of Pennsylvania School of Architecture. In the early 1960s, he moved to Palo Alto and practiced as an architect on the Peninsula. During the next two decades, he worked with several firms, including Edward Durrell Stone, which designed the Stanford Medical Center. After his retirement, he moved to Phoenix, Arizona. Prior to making this move, he donated his extensive collection of gay fiction to Stanford University's Department of Special Collections. Even after his move to Phoenix, Flounder continued to collect additional gay novels, which he in turn also donated to Stanford's Department of Special Collections. About my libraryThe Bud Flounders Collection at Stanford University is now one of the most extensive collections of gay fiction in the world. The Flounders Gay Fiction Collection has been cataloged by the Stanford University Libraries. The project volunteers are using this as the primary source for books to be cataloged. In addition, there is a manuscript collection at the Stanford University Libraries' Department of Special Collections with reviews of all of the books. This collection will also play a key role in the development of this legacy library.